Welcome to our new subscribers, and hello everyone! Wine is flowing into VisitVineyards.com's offices, and we're thoroughly enjoying the process of selection of our first wines to offer you, our loyal subscribers. We've made some great finds already and been blown away by the quality of many of the wines being submitted. But you'll have to wait just a little longer to get hold of them – like all good things, they take time. Get ready for some wonderful wines in November, just after the Melbourne Cup! Plus, we've been busy – very busy. First, there was our subscriber survey in June, immediately followed by our Wine Industry Outlook survey in July/August. Then as if that wasn't enough, the Winemakers' Federation of Australia published two major reports on the industry's future... so, we ran another survey on that, also for industry. We are surveyed out! But, the feedback has been fabulous. There were over 600 responses combined for the wine industry surveys; thanks if you're a wine person reading this and you filled them in. Our wine store has been on hold until we got that done, as VisitVineyards.com is a strong supporter of the industry – especially the small to medium growers/makers – and we think it's really, really important that the voices of smaller growers and makers are heard. 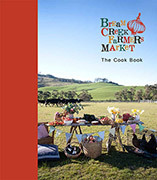 Assisting recovery from last summer's bushfires, a new regional cookbook will be launched at Tasmania's Bream Creek Farmers' Market on the Tasman Peninsula in early November. Summer feels like it's nearly here already in some parts of Australia, so get ready for some fresh, great tasting and healthy food with a sense of adventure and fun in marie claire Summer (which if you look out, you might find at a bargain price in your local Post Office!) A great gift cookbook for the young at heart or for the novice, a good cookbook for everyone else. Around the country there are wine and food celebrations aplenty. From boutique wine tasting to month long food appreciation, beers from around the world to taste in Hobart and Night Noodle Markets in Melbourne during Good Food month. It's all happening! Event organisers and marketers (including those in New Zealand), quickly and easily LIST your food and wine events in our calendar for FREE. To reach our subscribers, simply go to VisitVineyards.com/MyLogin and enter your event details. Win a vineyard break, wine and heaps more! My goodness. what a great array of prizes to choose from (or choose all!). At this time of year many turn their thoughts to holidays so if you're toying wth the idea of a WA trip, then a vineyard break might tempt you! Or a unique wine tasting? We also have some excellent books and unusual prizes. To any winners waiting on prizes, Kerry apologises but she's cruising down the Rhine and will be back in early November. She did try and contact you before she left! If you'd like to expand your wine knowledge and library we highly recommend these books. With the festive season looming, they would also make fantastic gift for the wine-lover in your life and you pay less too! In The History of Australian Wine, Max Allen weaves the story of 20th century development through the firsthand recollections of winemakers, grape groweres, cellar hands, retailers, business people and more. This creates a unique insight into the wine industry over the last six decades. The late, great Len Evans AO, OBE, penned much that was interesting and informative on the wine world including these two exceptional books: Not My Memoirs and How to Taste Wine. We highly recommend them for anyone interested in wine, its development or just keen on an entertaining read with many laughs included in the case of his non-memoirs. Did you know that tomorrow is FAO World Food Day? Sure, we now have 'world days' for just about everything, from wine varieties to pets, but this is the real deal and has been running since 1945, and marks the date on which the UN's Food and Agriculture Organisation was founded. This year's theme is Sustainable Food Systems for Food Security and Nutrition and this year the FAO want us to think about what would a sustainable food system look like? Is it possible to get from here to there? What would need to change to move us in that direction? Back home in Queensland, sadly 60% of the Sunshine State is now in drought. Stock are starving, our farmers are getting depressed, and there is still a long way to go before the wet season starts. Click here to help right now by donating to Buy A Bale, an initiative of Aussie Helpers based in Charleville. Your money will go direct to affected farmers to help buy hay ($20), diesel (any amount), gift cards for groceries ($20), and more. Thanks very much and have a great month! Good luck for those into the Melbourne Cup, and see you on VisitVineyards.com soon. Cheers from Robyn, Kerry, Andrew and the VV team. From our friends in the Macedon Ranges and a refreshing cider from the Centre of the Apple Universe! Please include price information and tasting notes, and food matching suggestions (if relevant) and recipes if you wish.